LA GRANDE, Ore. - The Oregon Tech women's basketball team fell Friday night to No. 6 Eastern Oregon University 85-57. 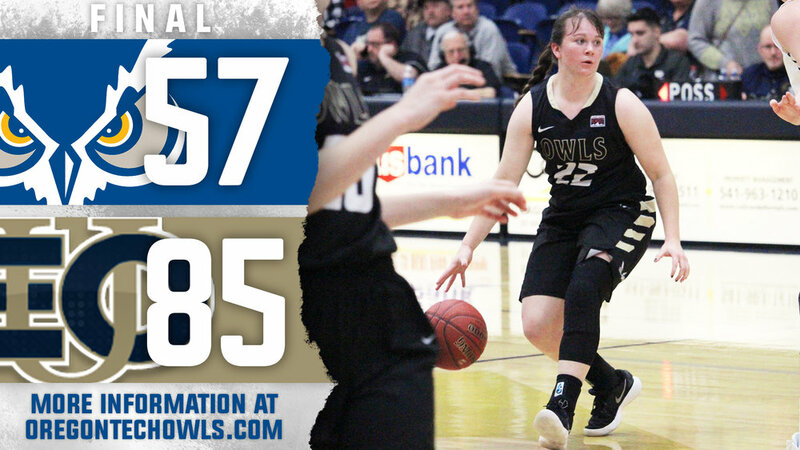 The Lady Owls got some help from rivals Southern Oregon University as they downed College of Idaho 70-62 in Caldwell, Idaho. The C of I loss secured Oregon Tech the fourth place finish in the CCC Standing and a home quarterfinal playoff game next Tuesday, February 20thagainst College of Idaho at 7:00 pm at Danny Miles Court. With the win Eastern Oregon clinched the Cascade Conference regular-season title and the Automatic berth to the NAIA DII National Championships in Sioux City, Iowa March 7th through the 13th. Quarterfinal Playoff tickets will go on sale Monday morning at 8:00 am in the OIT Athletics office. General tickets will be $5.00, reserved seats $6.00, OIT Students $2.00. Reserved season ticket holders will have until Monday at 5:00 pm to claim their seats. All remaining reserved seats will be available to the public beginning Tuesday morning at 8:00 am. For more information on tickets call the OIT Athletics office at 541.885.1634. EOU took control early leading the Lady Owls 20-12 after the first quarter. The Mountaineers extended that lead to 42-25 at the half. Eastern took their largest lead at 34 points with 2:28 remaining in the third. OIT outscored EOU 14-12 losing by the 85-57 score. Tech was led by Nohea Waiwaiole with 13 points with Mikaela Shumaker adding 12 points in the loss. Oregon Tech will wrap-up the regular season Saturday at College of Idaho in Caldwell at 4:30 pm. Press release from Oregon Tech Sports Information, Michael Garrard - Director of Sports Information and Marketing.